The Army Chief of Pakistan is seen by the United States of America as a valued and respected partner against the terrorism and wishes him well for his future pursuits, said a US official on Tuesday. According to the Diplomatic sources, the announcement of the new Army chief of Pakistan is expected on Saturday, 26th November. When asked to comment on the reports regarding General Raheel Shareef, who will be stepping down as the army chief, a US State Department spokesperson said that decisions regarding the change in Pakistan Army is the country’s internal decision and it was only appropriate that any statement regarding this change should come from its government. “We have seen the reports about the chief of army staff transition. This is an internal Pakistani matter, and I would direct you to the government of Pakistan for any further information,” the spokesperson said. In the statement, it was acknowledged that Gen Sharif was “a valued and respected partner in the regional fight against terrorism throughout his years as army chief”. “We congratulate him and his family and wish them well,” it added. 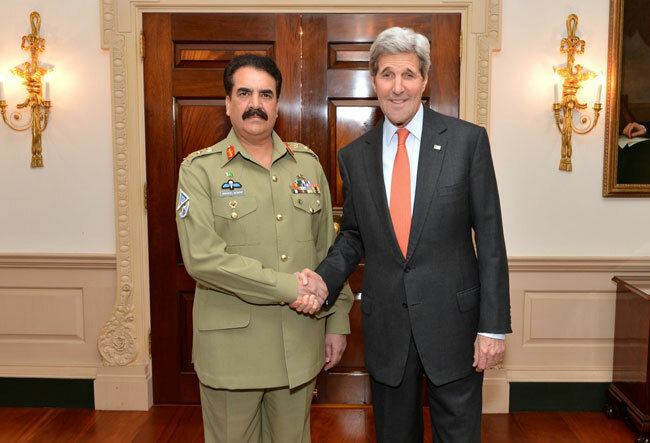 General Raheel held two meetings with US Secretary of State John Kerry during his visits to Washington in 2014 and 2015. The first meeting was acknowledged by Secretary Kerry, saying that Pakistan has been successful in its fight against the terrorism. He also praised the professionalism of the army and termed the institution a ‘truly binding force’. US Special Representative for Afghanistan and Pakistan, Dan Feldman, who was also there at the meeting, praised Gen Sharif’s commitment to the fight. “People in Washington were very pleased with his commitment to fighting all terrorists, including the Haqqani network, he said, referring to the Afghan militant group. Whereas, in the second meeting, Secretary Kerry expressed similar sentiments after the second meeting as well, and recognized “the contributions and the enormous sacrifices made by Pakistan in its fight against terrorism”.